Pizza-Porta™- Have Fun - Make Great Pizza. 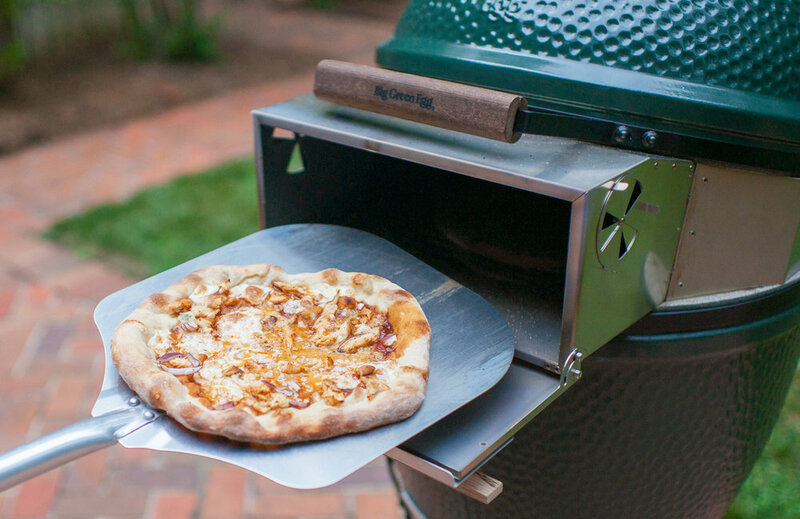 The Pizza-Porta is a specialty product that converts a Big Green Egg or a Kamado Joe into an authentic pizza 0ven. Capping off the top retains the heat, and our patented door and airflow control keep the temperature under control. You will enjoy consistent, even temperatures for hours of pizza cooking or hearth baking. Stretch your dough, place on a peel and slide into the oven, just like a pizza place. Designed for a double rack. Cook 2 pizzas at the same time. Add the capabilities of a wood-fired pizza oven to your ceramic grill. The Pizza-Porta sits between the base and the dome. Installation is simple and this provides an air-tight fit. Pull your hot, fresh pizza out with a peel. With a great wood-fired oven, you can make bread too! With an oven door, you can count on consistent temperatures all evening long. We can help you learn pizza making. Check out our products, or come and see us in person. The heat source in a kamado grill is below the pizza stone. The fire heats the plate setter, which heats the bottom of the pizza stone. The dome does heat up as the heat rises and escapes through the chimney. The challenge is that the heat is exiting so rapidly that it is difficult to get the dome hot enough to cook the top of the pizza. As the temperature is increased over 450F the differential in temperature increases and the pizza stone burns the bottom of the pizza before the dome can cook the top. Opening the lid to add or check a pizza complicates temperature control even further because each time the dome is open 1) Significant heat is lost, 2) The dome ceramic cools 3) The fire is fully vented. This variability in temperature detracts from the quality of your pizza crust. With the Pizza-Porta installed, the interior stone setup is the same. The performance difference is due to the modification of the cooking chamber. Heat is trapped in the dome. This heats the ceramic of the dome to balance with the surface temperature of the pizza stone. Heat must also pass over the pizza to escape out the side vents creating convection cooking. The size of the door is calibrated so opening it has limited impact on the interior temperature. Closing the door retains the control of airflow (and therefore temperature). All of these details ensure that the cooking environment inside the oven is balanced top and bottom and consistent between pizzas. This balanced temperature chamber will make lighter, crispier crust; whether it is one pizza or twenty.